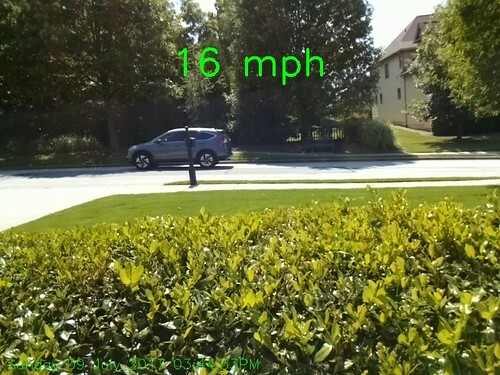 This entry was posted in Raspberry PI and tagged car, opencv, picamera, speed, velocity by gregtinkersdaily. Bookmark the permalink. Hi Greg. This fills a wonderful void that I am sure would interest a lot of people with a similar issue…speeding neighbors. Do you sell this as a “ready to use” kit? This exercise was meant to prove that speed measurement was possible with a Pi. It was a learning experience for me and I share it so that others can benefit from the result. Once you have a Pi with OpenCV and Python installed, you only need to download the program to use it. Also, selling it as a kit would imply the results are accurate, which may not be the case, since so many factors can throw off the final reading. Hope that’s ok Greg – don’t want to detract from your excellent project! Sorry to hear you couldn’t get the code to run. If you post questions here or on the carspeed github site, someone may be able to help you. The app looks interesting, and seems to use the same concept, but where is the fun (and education) in buying an app you can create yourself? hi greg i don’t know if you still monitor or get these replies but i was wondering if it possible to set up a 2nd monitoring area and track both areas ? Since there was a bug in the initial version, I’ve replaced it completely. WordPress doesn’t give me a way to start a new comment thread. However, feel free to start a new topic on the Carspeed gitbub site if you would like. I’ve closed the existing issue threads on github so the all new comments or questions have a starting point after the update. Carspeed can only measure cars passing horizontally, perpendicular to the camera. If the camera is perpendicular to the road, but the the road isn’t horizontal, just rotate the camera to make it horizontal. If that isn’t satisfactory, you will need to enhance the program to track the motion of an object at an angle and calculate its speed. 1: how do I make the caption of the image in high resolution ?, Example: when I do a manual capture “with RPi_Cam_Web_Interface of silvanmelchior”, the captured image comes out in high resolution and weighs 2.44 mb, if I configure it in “Image Res: 2592 x 1944 “and the clear image comes out, and the plate is visible. In the same way as I do for “carspeed.py”, make the capura of the image in good resolution with the intention of reading or distinguish also the plate ?. Observe that “carspeed.py”, your vehicle weighs 256 kb, how or where do I to make it look clearer? 2. How do I make a rotation of 90 or 270 degrees of the camera through “vs.camera.rotation”, so that I can handle the rectangle drawn horizontally, without having to move or rotate the camera physically? Rotating the image will change the monitored area, so I am not really sure this will be of help to you. This is a very interesting project but unfortunately about 15% of the cars going from left to right get measured wrong here. The speed is much to high, sometimes rediculous high. When I look at the shell window, I see the different speed readings the program takes for every passing car and the values differ from -12 to 60 and have all values in between. In most cases the value in the photo is quite close to what I would have guessed but in too many cases the speed is obviously complete wrong. Can I somehow “see” what the image tracking tracks? I’m only 13 meters (39 feet?) away from the road and usually a car passes my window in about 0.8 seconds. Are these values a problem in any way? The background of the picture is mostly a house on the other side of the road. It would be useful to see the captured frames and the reference point, that was taken for the speed measurement. Are you using a Raspberry Pi 3? How large an area in pixels are you monitoring? Did you change the camera resolution? Remember, image processing is taxing the pi to its limits, so being accurate 85% may be the best you can hope for. You are welcome to improve upon the logic to make it more efficient. You may want to check out this version which uses threads to speed up the image processing. You can display the image at any point using the cv2.imshow command. During development I had several windows open to display the image transformations as they occurred. Hello and thank you for your answer. I use Raspberry Pi 2 (don’t have a model 3 here). The area I’m monitoring is probably half of the picture width (there are some poles I didn’t want to have in the picture, because of that I use such small region). So width is something about 320 pixels. the height may be 20% – 25% of the width. A car fits into this window approximately 2 – 2.5 times in length. Before I try to understand and modify your brilliant work, I will try to get informations about the precision I can expect from the radar approach. it is weekend and so I spent some more time with this very interesting project. I observed another car, that was measured much too fast and had a look at the shell window. As you can see, the first car was only tracked two times. But it wasn’t faster than approximately 40 km/h (25 mph), so quite normal speed. As far as I understand from the comments in the code, the saved picture should show the car, when it hits the border of the drawn frame. But this saved picture shows the front of the car in the middle of the drawn frame! The first vehicle must have been moving fairly quickly since it covered the monitored area in .14 second. The last two vehicles passed through the monitored area in .87 and .81 seconds respectively. The image from the last complete reading is saved. Since a vehicle may have exited the monitored area on the last frame, it is the second from the last frame that is used. Since there were only two readings on that first vehicle, it showed the first frame. Since you are fairly close to the road, try making the height of the monitored area smaller. The monitored area doesn’t need to completely contain the vehicle – a thin sliver passing through the monitored area is sufficient to detect. That may reduce the processing time and give you more frames for computing the speed. I modified the code in a way, that all cropped images are stored for fast cars in tracking state. In each and every wrong measurements two cars were involved. This was not visible on the single photos that are usually taken. Good job sleuthing your issue – carspeed just isn’t able to handle multiple vehicles in the frame at the same time. If you have any idea I would greatly appreciate it. I haven’t the slightest idea what to do except completely start over and try again. Thanks! It looks like you do not have the most recent version of opencv installed. The number of values returned from the findContours function changed in the newer version. Revise the (_, cnts,_) to (cnts,_) and I think it may work for you. That worked! Awesome, now to wait for some light to give it a try. Thank you! I’m seeing that its outputting pictures into the root and its going to load up fast on my street. Is there a way to output it so that it can be view lived on a webpage? Maybe overwrite to the same image name then autoupdate the page? I’m not really sure, just an idea, or even better a live image and a top 5 based on speed for the day. and see if it helps you understand the changes that will be needed. Can we use a ip camera ? Possibly. The program is designed for a Picamera so it would require extensive changes. CarSpeed requires a resonably high frame rate and I don’t know what an IP Camera would provide. Give it a try and let us know the results. I had carspeed.py running before (the old version). I have seen that another user had this issue on github but the steps involved did not fix it for me. I have picamera installed when not working in the virtualenv. python3-picamera is already the newest version. How can I include python3-picamera in the virtualenv “cv”? sudo apt-get install python3-picamera says that it is already installed. Is this command checking the global site-packages or the virtualenv only? When running NOT in CV virtual enviroment and running “python carspeed.py” it works. Albeit it runs on python 2.7! It is difficult to diagnose this issue, but I suggest reviewing the comments on the pyimamgesearch page where several people had the same problem with cv2. This is a great little program. I just started using it to see how many people on our private community drive close to our 15 mph speed limit. I’m not a programmer, but would it be difficult to code this program so that you could save the detection box parameters, and have it start at boot up, and run in the back ground? That will hard-code the monitored area parameters. Remember that once you have done this the camera cannot be moved. Research running a program on the Raspberry Pi at startup. There are many resources on the web to help you.. Brings down the discussion on a facts and figures base! Is there a specific PI-camera needed? I saw several different models. Maybe you can advice a part number or provide a link to the one you have used. Since I cannot set it up like you stationary in a house, I like to work with a 30kAh battery pack and access the RPi3 bei VNC over WLAN. Will the maintenance of the motion detection area work this way? Maybe you have also experience about the power consumption? Finally: Is it relevant to have the camera aligned to the point of measure in a certain way? I mean thinks like orthogonal to the street and also verticallay aligned orthogonal rather than sloping? What is typical failure of measurement? Thanks again and: Well, well done! Any Pi Camera can be used. Just adjust the field-of-view in line 68 to match the field-of-view in the version that you use. Yes, it works fine using VCN. I don’t know specifics about battery pack usage, but I powered a Pi for 6 hours using one and the battery still had plenty of charge left. For reasonably accurate readings, the camera must be perpendicular to the road. You’ll need to experiment to see if the slope distorts the readings. It was meant as a proof-of-concept, and is not extremely accurate by any means. Only one car can be tracked at a time and passing clouds, wind blown leaves and stay cats can corrupt the reading. Thanks for your prompt and detailed replay, Greg! Hi Greg – thanks so much for this… exactly what I was looking for! I have a Pi3 with PiCamera2. I have updated the constants accordingly for my setup. I am getting accurate results from left top right (+/- 1 MPH), but way off on the right to left measurements for some reason. From left to right, 25MPH is logged at 26MPH, but from right to left, it is logged at 16MPH. More pronounced at higher speeds -> 35MPH is logged at 20MPH from right to left, for instance – but still pretty accurate from left to right. Our house and road are on a slight decline, but I have tried aligning the camera so it is parallel with our road, playing with my capture area, etc. to no avail. Can you think of anything obvious for me to check? I feel pretty confident with my setup, especially because my left to right values are so close. The pixel difference between the two tests is very small, but that generated a large speed difference. How far are you from the road and what resolution are you using? Thanks again for the response – yeah, the Left to Right readings are consistently logged every 0.1 second, whereas the Right to Left readings are logged between .13 and .14 seconds. ..the only thing that I can think is that the cars coming from right to left traverse the shade of the trees – maybe that is affecting the capture logic? Also they are being split by your mailbox. Try excluding it from the monitored area. Thanks for the response Greg. The camera is 50 feet from the middle of the road. I started with the 640×480 resolution and the mailbox excluded (same results though). I am now at 800×600. Greg – I wound up setting up different distances for cars going left to right and those going right to left (each generating different ftperpixel values). Results are much better now. First of all, AWESOME PROJECT! This is amazing dude! Now, to the question: Is there a way to place the camera in front of the road? I mean, I don’t have the possibility to measure fron the side, as there’s no much space from where I can place the camera to the road. Can I place it in front of the cars that come and go? If so, any chance you can point me in the right direction on the configuration? Measuring speed using a Pi Camera from the front would be difficult. You might want to check out this article from Make Magazine. for another approach. The Mattel radar detectors are available on eBay for about the same cost as a Pi Camera. I bought an “Arducam 5 Megapixels 1080p Sensor OV5647 Mini Camera Video Module”* along with a RPi 3. Do I need to get a lower megapixel camera or can you tell what I need to modify in the config file to make this work properly. Right now everything is installed and working except for blurred picture grabs. Thanks for the great program, I hope to help the overworked local police by giving them a time frame by which to observe the unlicensed pilots that are failing to maintain a proper altitude through my neighborhood. Thanks again. If this gets posted twice, it said it was not posted the first time. The issue is that the Raspberry Pi 3 has limited processing power. OpenCV will not be able to process frames fast enough to get a speed reading if it is working with too many pixels. Try reducing the resolution and just monitoring a limited area to see if that improves the results. I can only guess that you have a problem with the installation of opencv. The error points to libgtk2.0-dev and pkg-config missing. I’d start there. Sorry, I do not have a version of this program that uses a USB webcam. Pretty job, man. I did my own setup and it works out of the box. Just did some small changes in code to present data in metric system and added few lines to send data to thingspeak. I observed some missed vehicles in low light. I mean I see (hear rather) car, in output I see Trackig message, few samples with time and position, but at the and there is “No Car Detected” and no csv entry and no picture saved. From the other hand i’ve got proper entry in thingspeak. Something weird and i have to investigate whats the cause. Looks to be an awesome program. New to the Raspberry Pi and programming in general. I installed opencv and your program on a New Raspberry PI 3b+ that already has Python 2 and 3 installed. When I try to run your program it says ” can’t find ‘__main__’ module in ‘carspeed.py’. Any help would be appreciated. There are a number of causes for that message – probably something to do with the way you created your copy of the program. Do a Google search and check your code for the possible errors. 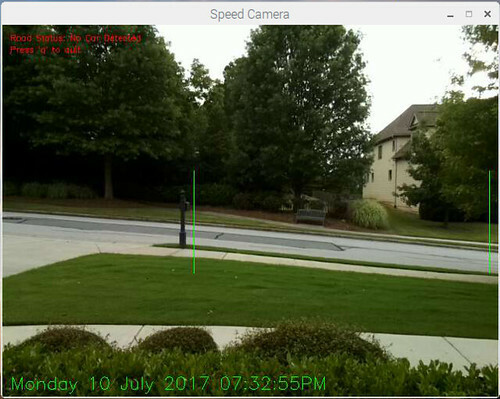 i have a question for you .. i have a code to calculate the vehicle on the highway using opencv python. I want to add the speed of the vehicle into my code. but I am confused how to enter the code to calculate the speed of the vehicle in my vehicle count code .. can you help me to solve this problem? can i request your email? i will send my vehicle counter code to your email and you can add speed of each vehicle .. i need your help sir thanks. CarSpeed calculates speed (s) by measuring the time (t) the vehicle takes to cross the image. If you know the distance the image covers (d), you can use the formula d / t = s.
Sorry, but I can’t write your program for you. 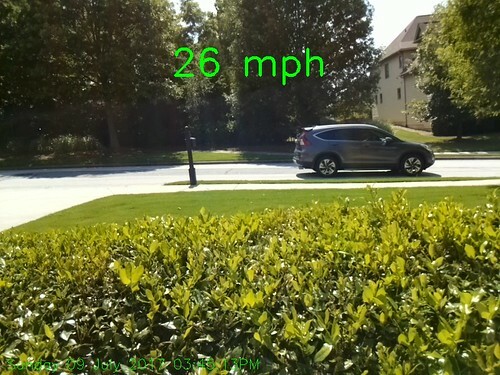 If you are using openCV to count cars, you should be able to determine the time it takes the car to travel across the image. Use that time and the distance the image covers to calculate the car’s speed. I downloaded your program today and got it running. I am getting consistent “No Car Detected” messages after every car. They track for a second, +/-, and speeds are listed. Any ideas where to look? How far from the road are you and what speeds are you anticipating? Are no images being saved to the disk? The camera is about 45 feet from the center line of the street, the car speeds range from 5 to 35 mph. There are pedestrians passing through. About 124 images have been saved, each with speeds written on them. But the terminal window shows “No Car Detected” for all of them. I will check for the .csv file in the morning. If the program is saving images with speeds, it is doing what it was intended to do. The ‘No Car Detected’ is just the state the program returns to after a car has passed and been recorded. Hi Gregg, I haven’t got started on this project yet, and have it as an active project on my to-do list for a neighborhood safety project and wonder what I would do in addition to what you started to add another camera to record the license plate too. Then the car speed plus the license plate automatically upload to a public site with a pareto chart speeds, cars, plates would be difficult for law enforcement to ignore. And the pi set up would be cheaper than the devices cities and law enforcement pay for those displays on streets that show drivers their speed but do not log data. 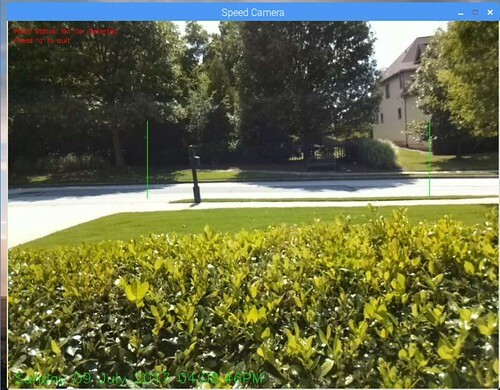 This project was meant to demonstrate the capabilities of the Pi and OpenCV. It isn’t designed or calibrated for speed enforcement (or public shaming.) It is not sufficiently accurate for that purpose. However it has been used to provide evidence that a street has a speeding problem to encourage police to increase surveillance. That said, you could add a second Pi and camera that would record an image of the front or rear of a vehicle. That Pi would need to communicate with the one running the Car Speed Detector program, which would trigger the license plate camera when a car’s speed exceeded your speed threshold. CarSpeed works best when it is 50 to 100 feet from the road, so I can foresee some technical issues with the communication link to the license plate camera. Thanks Greg. I’m so noob I assumed the Pi could have multiple camera inputs. I see that as your name suggests, tinkering is a necessary to learn capabilities of Pi (as we learn by doing in other aspects of our lives). Having a lot of fun tinkering with this! Quick question.. where in the code is the part where the last frame minus 1 is the frame that is saved (so you don’t lose the image of the car in the save as it has left the detection zone)? On that image also it would be great to get a box or a dot or something over the detected vehicle in the saved image (to try and human filter out false readings – ie, look back at a high reading and see that the red dot is actually on a something other than a vehicle). Finally, if i crank up the framerate on a PI3 do i need to mod the math? The last frame is displayed, but it isn’t include in the speed calculation. The speed from the previous frame is displayed (line 313 saves the value for use on the image). You can use a higher frame rate, but the processing does take some time, so a high frame rate may just mean more frames are skipped. No math changes required. If you want to add a dot, or draw a rectangle around the detected vehicle the values (x,y,h,w) can be used, Those are the parameter of the largest contour that was found. I think the code to draw a green rectangle around the car would be cv2.rectangle(image,(x,y),(x+w,y+h),(0,255,0),2) but don’t hold me to that as I cannot test it. I’d suggest reviewing pyimagesearch.com as it is a great resource to learn about image processing. I’m going to try to get this working on a PC with USB webcam. The extra processing power should be useful, and I intend to create a data log for later statistical analysis. Apart from figuring out how to read the camera, is there anything else that would be different? Not having tried to do that, I ‘ll let others reply. Please share your results here.